CRUCIAL INFORMATION: UNDERGROUND IS ACTUALLY CHEAPER!_EIRGRID HAS BEEN LYING. NEWEST LINKS ARE AT BOTTOM OF 'LATEST LINKS PAGE 5'. LATEST VIDEOS ARE AT BOTTOM OF 'VIDEO 3' PAGE. TURBINES KILL 13-39MILLION BIRDS - EVERY YEAR! 'CLIMATE CHANGE, MAN-MADE GLOBAL WARMING' IS ONE HUGE SCAM, MAKING MILLIONS FOR A FEW, RIPPING OFF EVERYONE ELSE, CAUSING POLLUTION AND DAMAGING THE ENVIRONMENT. WIND TURBINES ARE AN UNFORTUNATE POISONOUS SYMPTOM OF THIS MISGUIDED IDEOLOGY. Do not pollute the beautiful Tomduff Hill area with wind turbines. 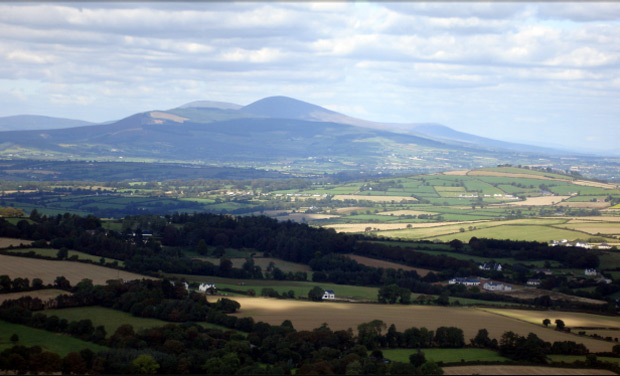 A planning application has been lodged for four very large turbines, a wind monitoring mast and ancillary buildings on private land adjacent Tomduff Hill in the beautiful Blackstairs Mountains in County Carlow, Ireland. These industrial machines,if built, would tower over a heritage site of outstanding natural beauty and blight the lives of many families living in Tomduff and surrounding area, not only from the threat to health by infrasound radiation and sleep deprivation but also by polluting the view from tens of miles around, not least from the town of Borris. This is in an area of outstanding natural beauty and one of the last surviving. The wind 'farm' will be sited adjacent to a Heritage Drive. The area is valuable amenity for locals and visitors alike, and an industrial development such as the proposed wind 'farm' would destroy the unique beauty of the area. The installations would stand some three hundred feet high and spoil the view from tens of miles in every direction as well as posing a danger to wildlife and the health of local residents, livestock and wild animals. The proposed development would only bring an insignificant amount of work to the area for the short period of 30 weeks, with no guarantee that any of this would go to local people, yet would blight the lives of a whole generation, and bring financial benefit to only a very small group of people. The development would also destroy the nature of the area and drive away tourists, walkers and cyclists and many other nature lovers who bring much needed income with them. If you care for the beauty of the Blackstairs Mountains please do some research, perhaps starting with some of the links posted on this web-site, and learn how little electricity can be sourced from the wind, how hugely expensive it is, how it does nothing to reduce any 'carbon footprint' and how it damages our environment. The proposed development is located in a visually sensitive, largely unspoilt upland setting adjacent to the Backstairs Mountains a candidate Special Area of Conservation (cSAC) - Site No: 00770 and which if developed would have a serious undue negative impact on the Backstairs Mountain Scenic Route’s (Route’s No. 16 and 11) as designated in the Carlow County Development Plan 2009 - 2015. It is considered that the proposed wind farm would be a visually prominent and unduly obtrusive feature in the landscape and which would adversely impact on the attractive undeveloped rural character, appearance, integrity and uniformity of this rural area. The proposed development would, seriously injure the visual amenities of the area and would conflict with the policies of the Development Plan, which seek to protect the heritage of the area. The proposed development would, therefore be contrary to the proper planning and sustainable development of the area. The application site is located up gradient of the River Barrow and River Nore a Special Area of Conservation (Site no: 002162) refers and adjacent to the Blackstairs Mountains cSAC (Site No: 00770). It is an objective of the Planning Authority to protect such areas as set out at page 94 of the Carlow County Development Plan 2009-2015. The Planning Authority is not satisfied on the basis of the information submitted, including the EIS and NIS that the proposed development would not have a significant adverse impact on the environment or result in the destruction of habitat of ecological value worthy of protection and which hosts a number of protected species and habitats. The proposed development would therefore, contravene materially the objectives of the Planning Authority to protect such areas and would therefore be contrary to the proper planning and sustainable development of the area. impact on the River Barrow SAC. In the absence of demonstration of same, the proposed development would be contrary to the proper planning and sustainable development of the area. It is reassuring that a listening Carlow Planning department and the valid concerns of local people can overcome the greed of a very few land owners and an industrial developer of wind 'farms'. https://www.facebook.com/groups/290679894294559/ - THE FRESHWATER PEARL MUSSEL IS OUR FAVOURITE BIVALVE MOLLUSC. LIVING WITH TURBINES:http://www.youtube.com/watch?v=jrNYwpIqDsU&feature=player_embedded#! IS NOISY, AND BAD FOR YOUR HEALTH. IT'S YOUR WATER - YOUR LAND - YOUR ENVIRONMENT - YOUR SUNDAY WALK - BUT MOST OF ALL IT'S YOUR HEALTH AND WELL-BEING - AND YOUR CHILDREN'S FUTURE. New articles are posted almost daily - see LATEST LINKS (Page 5). "Individual landholders within 2km of a proposed wind farm now have an effective right of veto. Developers will have to get their written consent for a project to proceed." "The landowner and developer are enriched while the consumer is impoverished by higher energy costs. Turbines are ugly, noisy and completely out of place in our beautiful, historic landscape."